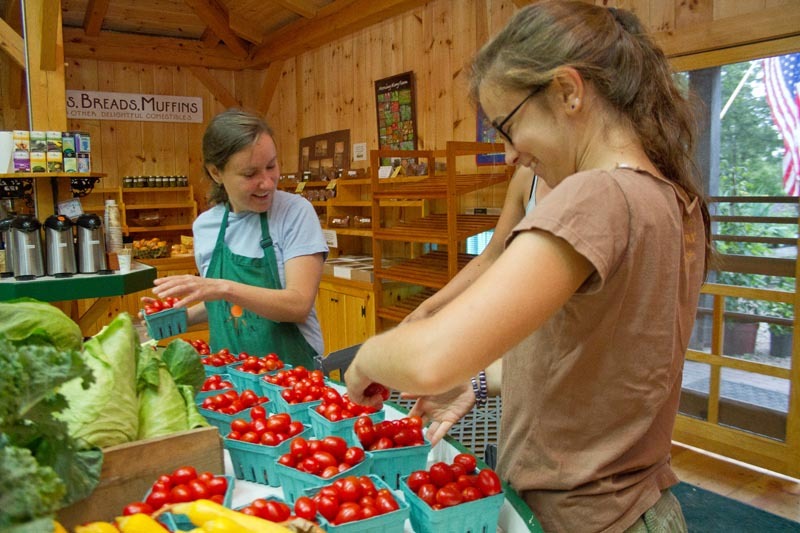 Kirsten Zink, left, and Ava Castro pack tomatoes at Morning Glory Farm. The first cut of hay was two weeks early, garlic is already being harvested across the Island and strawberries are likely to be done before it’s time for a July 4 pie. All across the Island, farmers are reporting crops sprouting earlier than usual this year, a fact they attribute to a mild winter and erratic but relatively warm weather ever since. Following an unseasonably tame winter, the Island experienced a lengthy drought in March, 80 degree days in April and 60 degree days in May, capped off by two weeks of intermittent rain. Last week, the sun and humidity reared its head for the season’s first heat wave, helping Vineyard fields to burst with ripeness. Farmers across the Island agreed that, because of these unusual weather patterns, crops that were directly-seeded into the ground did especially well this season, as did crops that wintered over. Plants produce at maximum growth when day temperatures are about 10 to 15 degrees higher than night temperatures, allowing the plants to photosynthesize and respire optimally during the day and less so during a cooler night. Most plants can grow only within a certain temperature range, and warmer temperatures spur on production. Higher temperatures also increase the rate that plants lose moisture as a result of transpiration, causing them to wilt. Although the weather has been warm, Mr. Athearn said that his corn is inching closer to a mid to late July arrival, on time, even with an early planting. Chris Fischer reported early garlic, a crop usually ready in August, at Beetlebung Farm in Chilmark. Bok choi and broccoli, normally July crops, are also “bolting earlier” he said, although “things are starting to get a little stressed,” he added. He direct-seeded radishes and peas in his grandfather’s garden, which “lived and did amazingly.” Carrots are also doing well for this time of year. Just up the road from Beetlebung Farm, Mitchell Posin and son Ned were haying two weeks earlier than last year at the Allen Farm. The first cut of hay yielded 66 bales. “Everything seems to be a couple weeks early, doesn’t it?” farm owner Clarissa Allen said yesterday. Rusty Gordon at Ghost Island Farm in West Tisbury remarked at his “nice giant beets” for the first West Tisbury Farmers’ Market of the year earlier this month, several weeks early ahead of schedule. “I had a big display and the beets were the most impressive thing I had,” he said. Herbs are also more bountiful than last season, said Breezy Pines Farm owner Heather Thurber, whose mint, chives and oregano are doing exceptionally well. “The rhubarb was awesome this year, really out of control, because it was really wet and then really warm,” she said. Large bunches of the stalk were still available at the farmers’ market on Saturday. At North Tabor Farm in Chilmark, onions, garlic, zucchinis and zinnias are all in bloom, earlier than usual. Farm owner Matthew Dix said he never had the brightly-colored flowers before July 4. Though he was nervous in March with draught-like conditions, he said a few weeks of rain following the long stretch without made up for the dry month. And as July 4 rapidly approaches, big red, white and blue bouquets may be fewer than years past, The Good Earth flower farmer Victoria Riger Philips said. The red lilies didn’t bloom for the holiday last year and are already in full bloom this week. The large blue hydrangea heads are also slightly ahead of schedule, normally blooming the first week of July in time for the Fourth. “It’s a little bizarre,” she said. But the earliest (and possibly most concerning) crop to arrive this year for Lisa Fisher at Stannard Farms has nothing to do with vegetables. “It’s all a puzzle,” she said. This column is meant to reflect all aspects of agriculture and farm life on the Vineyard. Remy Tumin may be contacted at 508-627-4311, extension 120, or e-mail her at rtumin@mvgazette.com.